Before you head out, you’ll want to remember to pack a few things: lots of water, snacks, sunscreen, sunglasses, and hiking shoes. Depending on how long you’re planning on hiking, you may want to pack your own lunch. Although, there is a restaurant at the visitor center at Paradise, so you don’t necessarily need to pack an extravagant meal. If you’re hitting the road from our neck of the woods, the fastest route to Paradise would be to take I-5 South and then on to 410 East, but I prefer a route that might add a few minutes and a few sights. Take 405 North to 169 (Maple Valley Highway). Eventually, you’ll connect with 410 just like you would from I-5, but before that, you’ll be driving alongside the Cedar River, through Maple Valley and on to an old mining town called Black Diamond. Coal mining might be a thing of the past in this small town, but the historical side of the town is still more or less intact. The famous Black Diamond Bakery has been attracting visitors far and wide since the turn of the twentieth century. Stop by here for some delicious donuts and coffee, or sit down for bacon, eggs and pancakes. Either way, you’re going to get your first great view of Mount Rainier (if it’s not cloudy) and a full stomach for your day of hiking. 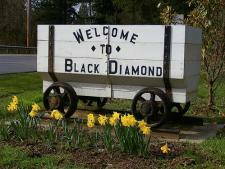 After you pass through Black Diamond, your drive will be pretty, pretty much all the way to Rainier. You’ll drive through the cities of Enumclaw and Greenwater, where the water is indeed, green (or kind of tan sometimes?). 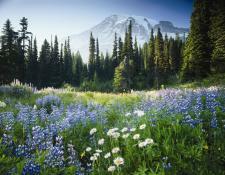 You’ll get better and better views of nature of Rainier. Go ahead and pull over a couple times for a photo op, but be advised that the drive is about 2.5 hours straight from SeaTac to Paradise and the photo opportunities will be endless on the mountain. Once you cross through the National Park gate (and pay the $25 entry fee for a single car), you’ve made it! Well, technically, Paradise is still another 20-30 minutes or so, but man…that drive is unbelievably beautiful! When you get there, parking can be tricky. If it’s a weekend, and it’s after 10:00am, it’s going to be packed. That’s why I’d recommend going on a weekday, but you’ll love it either way. You can stop in at the Henry M. Jackson Memorial Visitor Center and gear up, use the restroom, do what you need to do, and then head out on the trails! There are plenty of different trails for all skill levels, but my advice would be to take the skyline or alta vista trail and just go until you’re worn out. 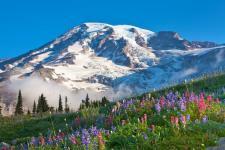 Families might turn around near the wildflower fields, but hiking veterans may make it all the way to Camp Muir, which is as high as you can go without a licensed guide. The point is, however far you go, you’ll get some of the best views of your life, plenty of fresh air, lots of exercise and a true bonding experience with your family and friends. For my detailed personal experience, check out this blog here.